We were all very excited when we got the news that our friends from Canada would be visiting us on Halloween! We were seriously thrilled for the fun that we were going to have. It started off on Halloween. 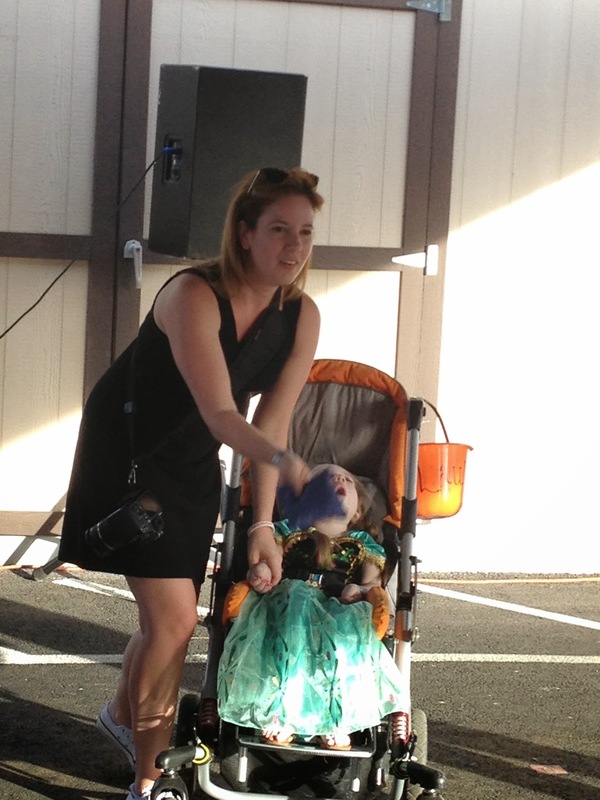 We took the girls to do some trick or treating at a chocolate factory that was by invite only. First stop was to take some pictures with some GIANT m&m's. Then it was time to play some games. Hailey would go first and introduce herself by saying, "I'm Hailey, I brought my Lauren. Say hi to her!" Hailey always made sure that Lauren was included and got a turn. There were a lot of games to play and win or lose you get a full size chocolate bar! Hailey also cheered Lauren on at each game and clapped for her friend. While there we ran into Hailey's Grandma! Lots of fun! Next up was getting faces painted. You know how much Hailey LOVES to get her face painted. Then it was Lauren's turn! We got more chocolate in 2 hours then we could possibly eat in a year! I think it was close to 28 pounds of chocolate! I know! Crazy! Once we got home and looked through all the loot we went and had dinner and planned for our upcoming ROAD TRIP!!! We packed up the car the next day, and headed 4 1/2 hours away to Arizona so that we could cross off an item on the girl's bucket list: The Grand Canyon. One really neat thing that Josh discovered is that you can get an entrance pass for free if you are a person with a permanent physical disability, a citizen of the United States, and if you have a signed letter from your physician. I had all my documents ready and turned them in so we could get Hailey her pass. It was very easy and now we can take her to any park that charges an entrance fee at NO cost! More information can be found online. The view from our room was AMAZING!! It was like camping with a luxurious twist....warmth! It was FREEZING!! I thought we'd be okay with just a light jacket, but I should have brought a parka! I didn't have a blanket for Hailey so I grabbed one from the hotel and used that to bundle her up. Once we got to the visitors center the canyon was a few steps away. In my opinion it was very odd to think how close we were to it the WHOLE time. It was so picturesque. It almost looked like we were on a green screen set. Hailey loved the colors! She loved sharing this with Lauren. I loved that one of my closest friends was there with me to experience this for the fist time. It was such an amazing place. At the Canyon they have shuttles that take you to many points around the canyon. I had made arrangements with a park ranger to allow us to take our own vehicle on the road for shuttles only. It was great to be able to pick and choose which points we got out of and which we skipped. 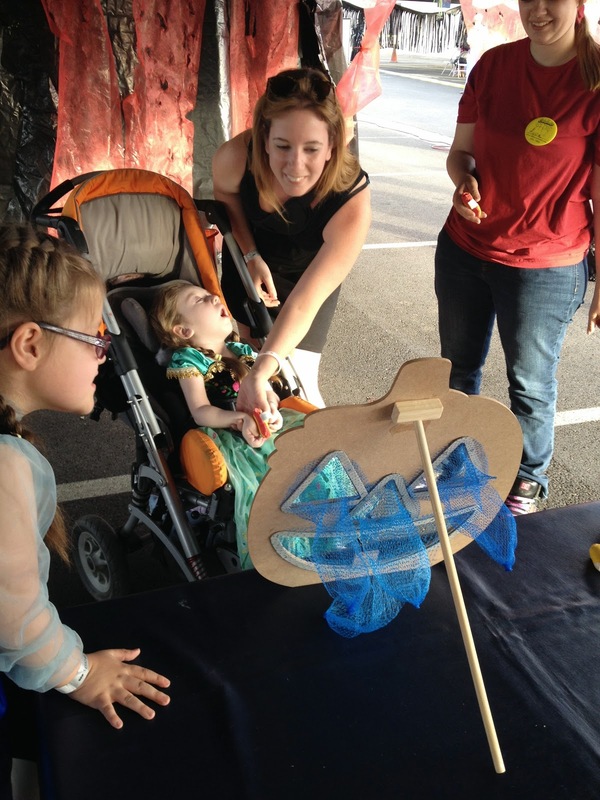 No waiting for shuttles to have to put both girls of the handicap lifts over and over. The Grand Canyon has been checked off of Hailey's list!! CHECK!! Hailey was ALWAYS by Laurens side. I love how much Hailey LOVES Lauren. Hailey even says she knows what Lauren wants or needs. Every time we stopped you hear Hailey say, "Lauren, we are here!!!" and what's funny is that Hailey changes her voice. Hailey becomes very motherly and sweet. 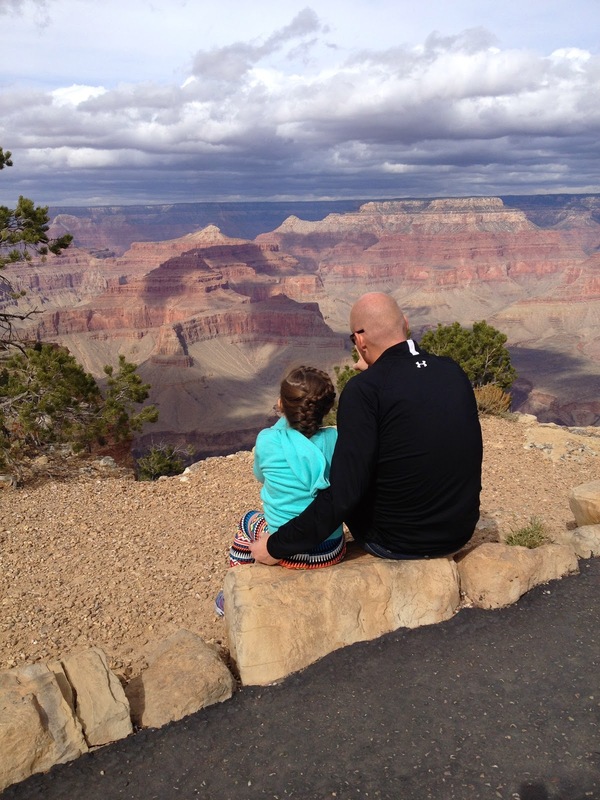 Hailey got to have a moment with her dad to take in the view. It was very special. Isn't it amazing!? This was taken with my phone! There were a couple of points where some of us would get out of the van to take a quick photo and the girls stayed inside. It just got colder and colder! 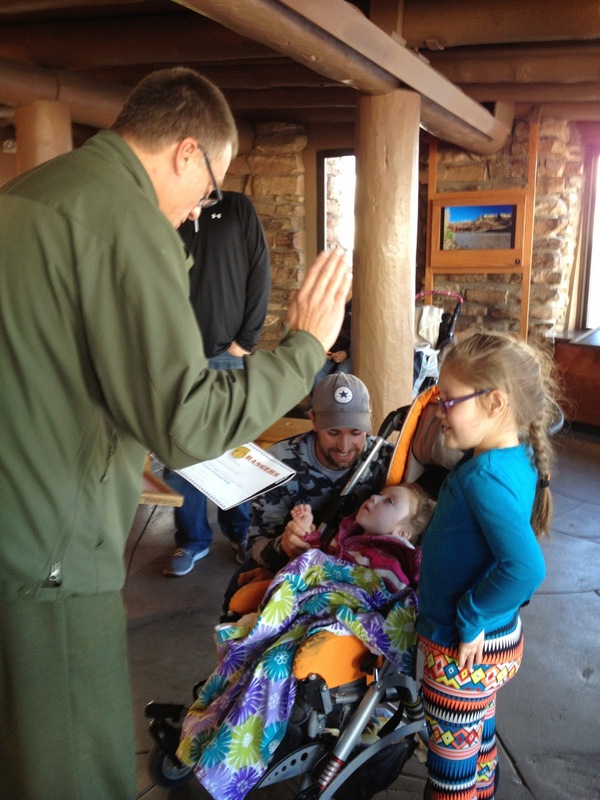 Another thing we arranged was for the girls to take an oath and to be sworn in as Jr. Park Rangers! It was SO adorable! When they got done taking their oath the people who stood around us all clapped for the girls! Amazing! Park Ranger Marty was more then happy to take some photos to help us mark the occasion! Thank you Marty! 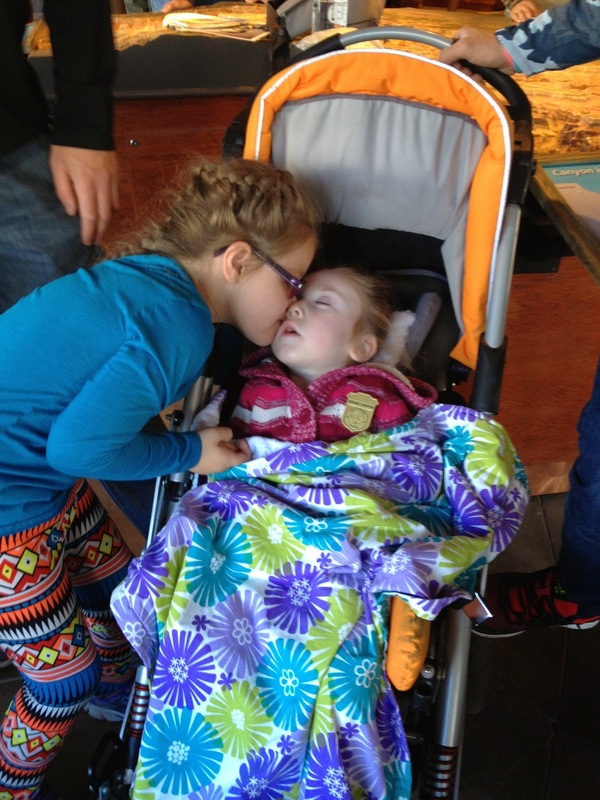 Hailey was so proud of Lauren that she had to give Lauren a kiss of congratulations! My Jr. Park Ranger. Hailey was very proud to show everyone her badge! This was such an awesome trip. I think we all had an amazing time. Thank you to Lauren's parents for coming along with us and I want to thank Josh for getting the info on the park pass and taking care of the hotel and the driving. These memories that we are making with our kids means so much to us. We are very grateful we have these opportunities to do so! !